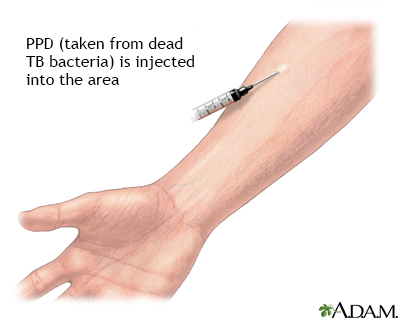 The purified protein derivative is an antigen (a substance that stimulates the immune system to eliminate or fight foreign substances in the body), which is injected under the skin in the forearem. After 48 to 72 hours the injection site is evaluated by a physician. This skin test helps determine if a person has ever been infected by the microorganism that causes tuberculosis.